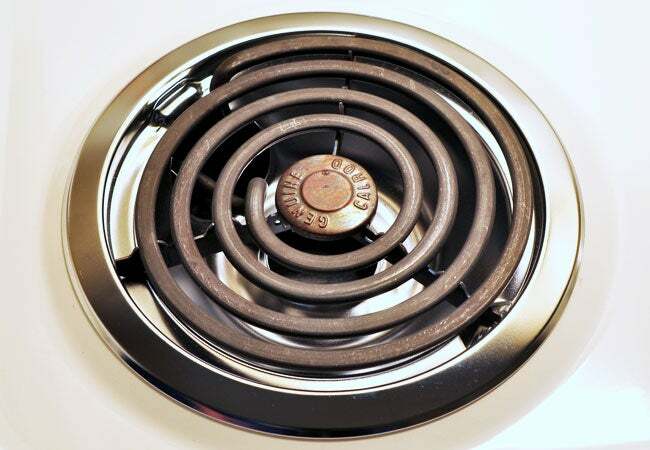 Banish caked-on food and grimy messes with these two methods for cleaning stove drip pans. Kitchen surfaces are bound to get messy from meal prep, but arguably none more than your stovetop. Take a good look at the drip pans at each burner. Chances are they’re covered with spaghetti sauce, cooking oil, and scrambled eggs that sloshed out of the pan and hardened into a concrete-like coating. But don’t whip out the toxic chemicals just yet! 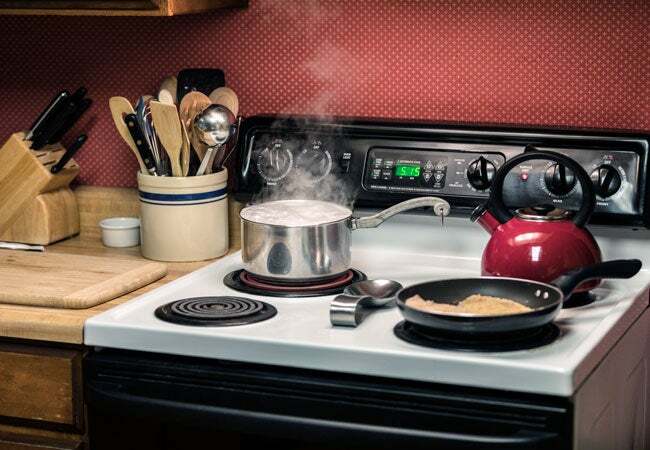 Here’s how to clean stovetop drip pans with nothing more than household items and some elbow grease, allowing homeowners to achieve sparkling cooktops with minimal effort. METHOD 1: Make scrubbing easier with baking soda and dish soap. Remove your (completely cooled) drip pans, shake off loose crumbs into the garbage can, and rinse the pans thoroughly in the hottest water your sink will provide. In a small bowl, mix liquid dish soap and baking soda in a 1:1 ratio. A half-cup of each is a good starting point, but you can add more if necessary. Use your fingers or a pastry brush to liberally coat each drip pan with the soap/baking soda mixture, scrubbing it into the pans. Some of the stuck-on gunk should start to loosen right away—if not, fear not. Simply proceed to the next step. Stack the soapy drip plates out of the way in your sink, and let them sit for about an hour. While you’re waiting, scrub the rest of your stove top with a damp sponge dipped in baking soda so that it’s ready to match your soon-to-be-sparkling drip pans. Wipe the baking soda off with a clean damp rag, then dry the stove with a soft dishcloth. Rinse the drip pans thoroughly with hot water so that all soap mixture is gone. Tackle any remaining dirty spots with a scrub brush or a sponge freshly dipped in baking soda. Dry the drip pans with a dish towel and return them to your stovetop. Replace the burners and enjoy cooking on your pristine stovetop! METHOD 2: Cut grease (and cleaning time) with ammonia. For an equally effective method that requires even less scrubbing, follow these directions for cleaning stove drip pans. The trick: extra soaking with stronger cleaners. It’s best to start the method after dinner so that you have a spot-free stovetop before the next day’s lunch. After dinner, wait for your drip pans to cool. Then remove them, rinse in hot water, and place each one inside a separate one-gallon sealable plastic bag. Add one-quarter cup of household ammonia to each bag. Don’t need to worry about coating the drip pans completely with ammonia; the fumes are going to do the dirty work to loosen burnt-on food splatter. Seal the tops of the plastic bags, then leave them stacked in your emptied kitchen sink overnight, or for at least 12 hours. Open the bags in a well-ventilated location (the fumes will be strong) and remove the drip pans. Then, seal and dispose of the used bags and ammonia still inside. If any dirty spots remain on the drip pans, wipe them away with a sponge and dish soap—it shouldn’t take much elbow grease at all. Rinse the drip pans thoroughly with hot water. Dry your drip pans with a towel and return them to the stovetop. Voilà! You’ll find zero traces of last night’s dinner on your hardworking kitchen appliance. Save yourself some trouble in the future: The best way for homeowners to avoid spending time cleaning up the stovetop is mindfulness during and after cooking. Make a mental note of mess as it happens, then wipe the stovetop drip pans clean of splatter, dust, and grease as soon as they cool down after each cooking session.